Home Maintenance & Repair Do you need an external spare tire cover? 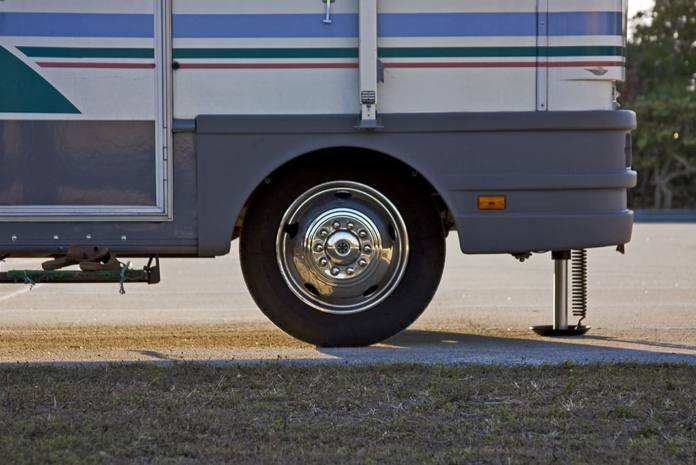 I was recently reading a forum where the owners of one specific brand of trailers were complaining about the $21 the RV company wanted to charge for a spare tire cover. I have previously covered in detail the advantages of and “why” we should be storing our tires inside or under our RV or under light-colored covers. It is the HEAT that kills tires, and the aging effect on tires is exponential (doubles for each 18° F). With such an increase in temperature, you could end up with a tire failure with ZERO miles, as seen in this example. I pointed out, with temperature data, in the above-referenced blog post, why white tire covers are good and much better than black covers. This shot (left) shows what can happen with a black cover that effectively places the spare in an “oven” where cooling air can’t offset any of the sun’s heat. These folks do it right (see right). I know of no tire shine or protectant spray that provides protection from heat. Next articleIs it safe to run that cheaper Walmart DEF? I’ve used both black and white tire covers, and have measured the difference in tire temperatures which in both cases was far lower than while driving. The temperature difference between white and black was negligible. The issue is not whether the white or black tire cover lasts, but whether the tire does. Yes, some additional points in favor of black covers: white only works with direct sunlight (it does not reflect heat – only sunlight), while damaging UV rays can be reflected. Also, up to 80% of damaging rays come through on cloudy days, and cause damage during colder/winter days, when heat is a total non-factor. That’s why, over time, UV has much more of a deteriorating affect on tires than heat alone.